Malnutrition, inflammation, and atherosclerosis are significant problems in patients on hemodialysis. A prospective, observational study in 100 hemodialysis patients for 2 years was conducted. The primary outcomes were hospitalizations and mortality at the end of 2 years. The mean age was 61 ± 11.3 years and 69% were male. Seven patients did not complete the study (five underwent transplant and two were shifted to other units). Serum albumin was significantly lower in malnourished patients at 6 months from the beginning of the study period (3.58 vs. 3.79 g/dl, P = 0.001). Malnutrition based on subjective global assessment (SGA) was seen in 30 (32%) patients: mild to moderate in 27 (29%) and severe in 3 (3%). Inflammation was seen in 73 (78.5%) patients and intimal-medial thickness of >1.1 mm indicating significant atherosclerosis was seen in 73 (78.5%) patients. Modified SGA score and malnutrition-inflammation score (MIS) were significantly more in the malnourished group. Statistically significant association was seen between hospitalization and mortality in the malnourished population, and the odds ratio of death in malnourished patients was 9.83 (95% confidence interval: 2.8–34.3, P< 0.001). There was a moderate correlation between malnutrition assessed by modified SGA and MIS score (r = 0.54, P< 0.001). Mortality rate was 37% in patients with mild to moderate and 67% in severe malnutrition. Hospital admission was seen in 43 (46%) patients and was significantly more common in malnourished compared to well-nourished patients (77% vs. 32%, P< 0.001). Multiple logistic regression analysis showed that malnutrition by Modified SGA was the only significant variable associated with mortality at 2 years, and addition of MIS score did not improve the predictive ability of the model to modified SGA. We recommend the use of modified SGA and serial serum albumin to monitor nutrition in hemodialysis patients. In India, an estimated 100–220 per million populations reach chronic kidney disease (CKD) Stage V due to explosion in the incidence of diabetes and hypertension. It is estimated that approximately only 10% of end stage renal disease patients in India receive some form of renal replacement therapy (RRT), mainly due to socioeconomic constraints, and hemodialysis (HD) is the predominant mode of RRT in India., Cardiovascular disease (CVD) is the most common cause of death accounting for more than 50% of all deaths, followed by infection, accounting for approximately 15% in western series. The adjusted rate of all-cause mortality is 6.3–8.2 times greater for dialysis patients than the general population. The early mortality is reported to be as high as 60%, due to late referral and septic complications. In a study conducted at a tertiary care institute in India, Chandrasekhar et al. studied 96 patients and reported mortality in only 19.8% over 24 months, and sepsis was the most common cause of death in them. Several risk factors including modifiable and nonmodifiable have been identified for the high incidence mortality in HD patients, which include advanced age, hypertension, CVD, diabetes mellitus, abnormal lipid metabolism, anemia, hyperhomocysteinemia, abnormal calcium and phosphate metabolism, and malnutrition. Among them, malnutrition is the most important factor associated with increased mortality in dialysis population. Whether malnutrition directly causes mortality or is a result of diseases which cause mortality remains a matter of debate. There is a significant association between inflammatory state, atherosclerotic CVD, and malnutrition, which has been described as malnutrition, inflammation, and atherosclerosis (MIA) syndrome. The presence of MIA syndrome is strongly associated with mortality in pre-dialysis CKD and dialysis populations. Nutritional assessment is done by several methods. Subjective global assessment (SGA), anthropometry, and serum albumin are the most common methods used in clinical studies to define protein-energy malnutrition in HD population. SGA has much strength in the clinical and research setting: it is inexpensive, rapid to conduct, and can be used effectively by providers from different disciplines, such as nursing, dieticians, and physicians. Several studies have shown that SGA is reproducible, valid, and reliable method and is recommended by the National Kidney Foundation Kidney Disease/Dialysis Outcomes and Quality Initiative for nutritional assessment in the adult dialysis population. Recently, Kalantar-Zadeh et al. introduced malnutrition-inflammation score (MIS), a quantitative tool that includes seven original SGA components and three additional factors, namely, body mass index (BMI), serum concentrations of albumin, and serum total iron-binding capacity (TIBC). There are no data available in literature that establishes a correlation between MIA with mortality or hospital admissions in Indian dialysis population. We conducted a prospective, observational study to investigate the association of MIA and their impact on the outcome in HD population. One-hundred patients undergoing hemodialysis at our center were studied prospectively for 2 years. During the study period, two patients were transferred to another dialysis unit and five underwent deceased donor renal transplantation and these seven patients were excluded from the analysis. We excluded the following patients from the study: age <18 years, on hemodialysis for <3 months, patients with malignancy, severe infection within 3 months, patients who were switched from peritoneal dialysis, patients who had failed renal transplantation within 6 months, patients on immunosuppressive drugs, and patients on temporary hemodialysis catheters. We collected baseline clinical data such as dry weight changes, dietary intake, gastrointestinal symptoms, functional capacity, comorbidity, viral infections such as hepatitis B and C and human immunodeficiency virus, vintage of dialysis, and hours of dialysis per week. All peripheral pulses, radiofemoral delay, and presence of carotid bruit were noted. BMI in kg/m 2 and signs of muscle wasting were recorded. We were able to obtain the online clearance monitoring for all the patients. High-sensitivity C-reactive protein (hsCRP), serum albumin, and TIBC were done at baseline. Serum albumin was again checked after 6 months. Nutritional assessment was done using SGA. Modified SGA score (dialysis malnutrition score) and MIS  were computed. The major comorbid conditions such as congestive heart failure Class III or IV, severe coronary artery disease, moderate to severe chronic obstructive pulmonary disease, and major neurological sequelae were recorded. Normal value of serum albumin was taken as 4–6 g/dl. Normal range of TIBC was 250–370 mcg/dl. The hsCRP level of >3 mg/L was considered as a high risk for CVD. Carotid artery intimal-medial thickness (CAIMT) was measured using a 3–5 MHz probe (Nanomaxx™ Ultrasound System, SonoSite Inc., USA) by a single trained person. Intimal-medial thickness was measured on both sides at three points: at the carotid bulb, proximal common carotid artery, and proximal portion of internal carotid artery. The average of the three readings on both sides was taken as the intimal-medial thickness. One in every ten readings was verified by a senior consultant radiologist to confirm the accuracy of measurement of CAIMT by the author. A CAIMT of >1.1 mm was considered as increased. Atherosclerosis was defined as the presence of one or both of the following criteria: history of CVD (cerebrovascular accident, coronary artery disease, or peripheral arterial disease) documented by interview and chart review and clinical evidence presented on physical examination, carotid ultrasound demonstrating a plaque in the carotid artery. IHD was defined as the presence of appropriate history with demonstration of regional wall motion abnormality by two-dimensional echo or provocable ischemia by stress myocardial perfusion study. Peripheral vascular disease was defined as the presence of any of the followings: history of lower limb claudication, demonstration of unequal pulses on both sides, or lower limb arterial Doppler showing atheromatous plaques on both sides. Cerebrovascular accident was defined as the presence of any of the followings: history of slurring of speech, unsteadiness of gait, weakness of one side of the body, and previous imaging studies showing infarct or hemorrhages in the brain. Hospitalization was defined as any hospital admission that included at least one overnight stay in the hospital. Hospital admission for a variety of disorders such as cardiovascular complications or infectious was included. Admission due to cardiovascular causes included accelerated hypertension due to volume overload or LV dysfunction, acute coronary syndrome, heart failure, and arrhythmias. The primary outcome of the study was death, and the secondary outcome was composite of death and hospitalization. The mean age was 61 ± 11.3 years and 69% were male. The demographic and laboratory characteristics are shown in [Table 1]. There was no significant difference in hsCRP, CAIMT, and serum albumin at baseline between well-nourished and malnourished patients. However, serum albumin was significantly lower in malnourished patients at 6 months from the beginning of the study period (3.58 vs. 3.79 g/dl, P = 0.001). Malnutrition based on SGA was seen in 30 (32%) patients: mild to moderate in 27 (29%) and severe in 3 (3%). Inflammation was seen in 73 (78.5%) patients and CAIMT of >1.1 mm indicating significant atherosclerosis was seen in 73 (78.5%) patients. Modified SGA score and MIS were significantly more in the malnourished group. There was statistically significant association between hospitalization and mortality in the malnourished population, and the odds ratio (OR) of death in malnourished patients was 9.83 (95% confidence interval [CI]: 2.8–34.3, P< 0.001). There was a moderate correlation between malnutrition assessed by SGA and MIS score (r = 0.54, P< 0.001). The correlation between mortality and malnutrition assessed by SGA was moderate (r = 0.42, P< 0.001) whereas that between mortality and MIS score was not significant (r = 0.11, P = 0.3). 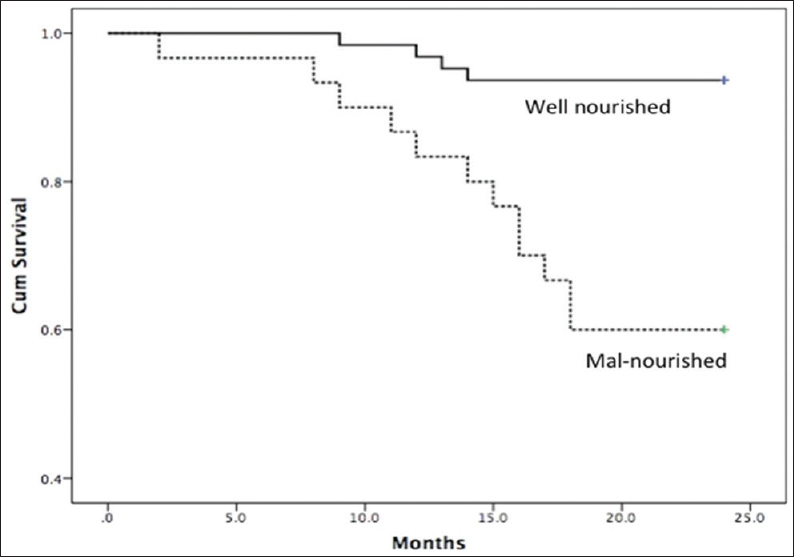 The primary and secondary outcomes in malnourished and well-nourished patients on HD are shown in [Table 2]. The mortality rate was 37% in patients with mild to moderate and 67% in severe malnutrition. The causes of mortality were CVD in 10 (10.7%) and infection in 6 (6.5%) patients. Hospital admission was seen in 43 (46%) patients and was significantly more common in malnourished compared to well-nourished patients (77% vs. 32%, P< 0.001). The reasons for hospital admissions were CVD (53%), infections (19%), surgical procedures (9%), and other causes (13%). [Table 3] shows the results of multivariate logistic regression analysis to identify the variables independently associated with mortality. Malnutrition was the only significant variable associated with mortality at 2 years, and addition of MIS score did not improve the predictive ability of the model. [Figure 1] shows the Kaplan-Meir survival analysis for patients with and without malnutrition. The incidence of MIA and their individual as well as combined impact on mortality is shown in [Figure 2]. All three components of MIA syndrome were seen in 20 (21.5%) patients, and mortality was significantly increased in this population (45% vs. 10%, P = 0.001). The OR of death in patients who had all components of MIA syndrome was 7.7 (95% CI: 2.4–25, P< 0.05). The mortality rate was 0% (0/7), 8.7% (2/23), 13% (5/38), and 45% (9/20) when none, one, two, and three components of MIA syndrome were present, respectively. [Figure 3] shows Kaplan–Meir survival curves for patients with ≤1, 2 and 3 components of MIA syndrome. The mortality was 6.5%, 6.0%, and 38.7% for first (mean hsCRP: 6.2 ± 8.3 mg/L), second (hsCRP: 11 ± 6.7 mg/L), and third (hsCRP: 23.5 ± 13.7 mg/L) tertiles of hsCRP, respectively. The mortality rate was significantly higher in the third tertile compared to the first and second tertile of serum hsCRP (P = 0.005). The mortality was 6.5%, 19.4%, and 25.8% for first (CAIMT: 1.05 ± 0.15 mm), second (1.4 ± 0.07 mm), and third (1.72 ± 0.18 mm) tertiles of CAIMT, respectively, and the difference between the tertiles was not significant statistically. We analyzed the impact of three interrelated components of MIA syndrome, namely, MIA, each in isolation and in combination, on the outcome of HD patients over 2 years period in a prospective study. Malnutrition in HD patients is common, and the prevalence varies widely between 20% and 60%. We assessed nutrition by the modified SGA, a validated method in HD patients  and found prevalence of malnutrition in 32% (mild to moderate in 29% and severe in 3%). The moderate prevalence of malnutrition in our study population is similar to the recent reports from developed countries. Todd et al. reported 35% and 25% prevalence in Aboriginal and non-Aboriginal Australian HD patients, who had acceptable parameters of dialysis adequacy, respectively. Mazairac et al. in a multicenter study from the Netherlands reported malnutrition prevalence of 23% in large cohort of 560 patients. In contrast, several investigators have reported a very high prevalence of malnutrition in HD patients from India. Janardhan et al. reported malnutrition in 91% and Tapiwala et al. in 58% in small cohorts of 66 and 28 HD patients, respectively., This difference is probably due to several factors such as adequate dialysis delivery since inadequate dialysis is highly prevalent across India. Our patients were on regular clinical and biochemical assessment to measure nutrition and were counseled by dietician regarding diet, which is often not the case in many Indian HD centers. Systemic inflammation is common in HD patients and is assessed by measurement of serum CRP or hsCRP level, which is released from hepatocytes in response to inflammation. A single measure of elevated serum CRP is a strong predictor of mortality and higher levels are associated with worse outcomes. High-sensitivity CRP testing has been shown to add to the predictive value of total cholesterol, low-density lipoprotein, and high-density lipoprotein, as well as the Framingham 10-year risk score. There are not many studies using hsCRP in hemodialysis patients. Studies have used both hsCRP and CRP to assess inflammation in hemodialysis units. A study from Tunisia reported that hsCRP level was elevated in 54% of HD patients. We found hsCRP level more than 3 mg/L, which is considered to indicate systemic inflammation, in 73 (78.5%) of our study population. The mean serum hsCRP levels were similar in well and malnourished patients in our study indicating a poor correlation between malnutrition and inflammation. 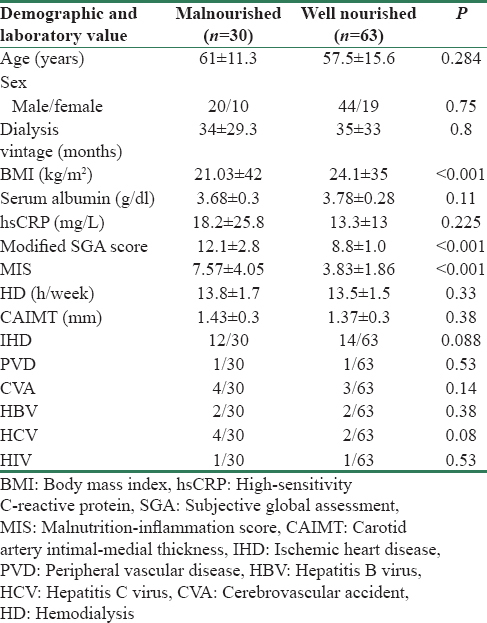 In addition, the serum hsCRP levels were similar between survivors and non-survivors, indicating that inflammation though common did not affect nutrition and mortality in our study population. We attempted to identify the level of hsCRP which could affect mortality by studying the hsCRP tertiles, which showed that highest tertile of serum hsCRP (N = 31, mean: 23.5 ± 13.7 mg/L) was associated with significantly higher mortality compared to lower two tertiles (42% vs. 6.5%, P = 0.005). We feel that mild elevation of serum hsCRP levels in our population has no clinical impact whereas levels higher than 20 mg/L may indicate increased mortality risk over 2 years. CVD is the most common cause of death in HD patients, and CAIMT is used as a surrogate for atherosclerotic burden in HD patients. In a study from eastern India, the average CAIMT in HD patients was around 1.136 mm. CKD patients and post-transplant patients have a lower average CAIMT values compared to CAIMT in HD patients. The authors speculated that the inflammatory milieu in maintenance of HD patients contributed to the increased CAIMT as the duration on dialysis progresses. A significant association between mortality and increased CAIMT was reported by Nishizawa et al. In another study from south India, the mean CAIMT in pre-dialysis CKD Stage V population, was 1.0 mm, while the control population had a CAIMT of 0.6 mm. This indicates that before the initiation of hemodialysis, there is already a significant risk of developing atherosclerotic complications and inflammatory state associated with HD may be an additional contributory factor in worsening the pre-existing atherosclerosis. In our study, there was no statistically significant difference of CAIMT among well-nourished and malnourished individuals. Age is also a confounding factor as most of our patients were elderly and advanced age itself being a cause of increased CAIMT. Calcium-phosphorus abnormalities and uremia-induced endothelial dysfunction also contribute to increase in CAIMT in CKD patients. Indeed, CAIMT appears to be higher in CKD population compared to normal population even in the absence of traditional risk factors of atherosclerosis, indicating significant contribution of uremia. We found increased CAIMT in our study population but found no correlation between CAIMT and nutritional status as well as mortality. Analysis of tertiles of CAIMT showed no difference in mortality between highest and lowest tertiles. We feel that measuring CAIMT has no clinical relevance in HD patients. This is in contrast to several studies which found good correlation between CAIMT and mortality in HD patients. Malnutrition assessed by SGA was a strong independent risk factor of death in our study cohort. Multiple logistic regression analysis showed that malnutrition was the sole independent predictor of death, and CAIMT and hsCRP levels did not independently affect mortality. In addition, there was no significant correlation between malnutrition, hsCRP, and CAIMT. This indicates that malnutrition in our patients is driven by factors other than inflammation and atherosclerosis and do not support the notion that inflammation and atherosclerosis are the prime drivers of malnutrition. This is in contrast to the reports indicating close association between the three aspects of MIA syndrome in HD population. However, mortality was significantly increased in our study cohort when all three components of MIA syndrome were present, compared to the presence of two or less components. The MIS score which incorporates additional factors such as BMI, serum albumin, and serum transferrin showed strong correlation with malnutrition but did not improve the predictive ability of SGA in the logistic regression model to predict death. We feel that SGA is a simple and reliable predictor of death, and additional biochemical tests to SGA do not improve the predictive ability and hence may not be necessary. This conclusion is similar to a study by Harvinder et al., which concluded that the Modified SGA score is a more practical and a simple score as compared to the MIS. Interestingly, serum albumin was similar in our patients between well-nourished and malnourished patients. Serum albumin at baseline was lower in non-survivors compared to survivors but was not statistically significant (3.68 ± 0.30 vs. 3.78 ± 0.28, P = 0.11). This is in contrast to several studies, which showed strong and independent association between low serum albumin and mortality in HD patients. One possible explanation for this discrepancy is the small sample size in our study cohort. However, we found a significant association between low serum albumin at 6 months and mortality (3.24 ± 0.21 in non-survivors and 3.82 ± 0.19 in survivors, P< 0.001). In addition, serum albumin measured at 6 months was significantly lower in malnourished patients compared to well-nourished patients. This indicates that serum albumin is a dynamic parameter and serial measures are better predictor of poor outcome in HD patients than a single measure. This finding is in agreement with the study by Zitt et al., who reported that time-varying serum albumin measurements are useful in mortality prediction in incident HD patients. Our study suggests that periodic SGA and serial monitoring of serum albumin are the best and reliable predictors of mortality in HD patients and may be used for monitoring in clinical practice. There are several strengths to our study. first, ours is the first study from south Asia to study the impact of components of MIA syndrome on mortality. We analyzed the contribution of different components of MIA syndrome individually and in combination, on the mortality over 2 year period. Second, we compared SGA with MIS, which has been scarcely done previously, to assess whether additional biochemical tests would improve the predictive ability of SGA in HD patients. Our study has several limitations. first, our study was a single center study involving small number of patients. Our study results need to be confirmed in a larger and multicenter study across India. Second, the duration of the study was short and longer duration of study is required to confirm the validity of SGA to predict mortality in HD patients. Third, we studied prevalent patients and a study involving incident patients would be more valuable in HD patients. Fourth, we did not assess in detail, the dietary intake to assess whether food habits and taboos contributed to the malnutrition in our patients. 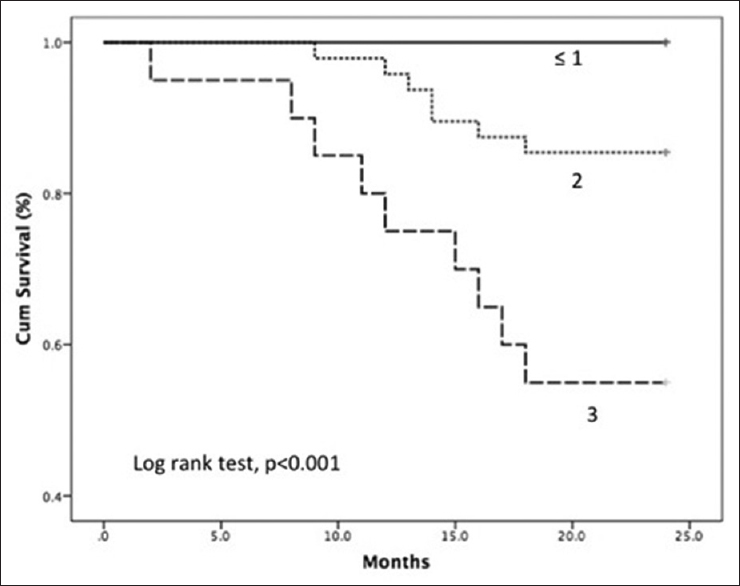 Elevated hsCRP and increased CAIMT were common in HD patients (73% each) but poorly correlated with 2-year survival. Malnutrition determined by SGA was seen in 32% of HD patients and was a strong independent predictor of death in them. However, mortality was the highest (45%) when all three components of MIA syndrome were present. Mortality prediction was better with SGA than MIS score. Progressive decline but not baseline serum albumin was associated with malnutrition and risk of death. We recommend the use of SGA and serial serum albumin to monitor nutrition and risk categorization for mortality in HD patients. Hamer RA, El Nahas AM. The burden of chronic kidney disease. BMJ 2006;332:563-4. Modi GK, Jha V. The incidence of end-stage renal disease in India: A population-based study. Kidney Int 2006;70:2131-3. Rajapurkar MM, John GT, Kirpalani AL, Abraham G, Agarwal SK, Almeida AF, et al. What do we know about chronic kidney disease in India:First report of the Indian CKD registry. BMC Nephrol 2012;13:10. Collins AJ, Foley RN, Herzog C, Chavers B, Gilbertson D, Herzog C, et al. US Renal Data System 2012 annual data report. Am J Kidney Dis 2013;61 1 Suppl 1:A7, e1-476. Rao M, Juneja R, Shirly RB, Jacob CK. Haemodialysis for end-stage renal disease in Southern India – A perspective from a tertiary referral care centre. Nephrol Dial Transplant 1998;13:2494-500. Chandrashekar A, Ramakrishnan S, Rangarajan D. Survival analysis of patients on maintenance hemodialysis. Indian J Nephrol 2014;24:206-13. Pisetkul C, Chanchairujira K, Chotipanvittayakul N, Ong-Ajyooth L, Chanchairujira T. Malnutrition-inflammation score associated with atherosclerosis, inflammation and short-term outcome in hemodialysis patients. J Med Assoc Thai 2010;93 Suppl 1:S147-56. Kopple JD. Pathophysiology of protein-energy wasting in chronic renal failure. J Nutr 1999;129 1S Suppl: 247S-51S. Clinical practice guidelines for nutrition in chronic renal failure. K/DOQI, National Kidney Foundation. Am J Kidney Dis 2000;35 6 Suppl 2:S1-140. Kalantar-Zadeh K, Kopple JD, Block G, Humphreys MH. A malnutrition-inflammation score is correlated with morbidity and mortality in maintenance hemodialysis patients. Am J Kidney Dis 2001;38:1251-63. Jones CH, Wolfenden RC, Wells LM. Is subjective global assessment a reliable measure of nutritional status in hemodialysis? J Ren Nutr 2004;14:26-30. Kalantar-Zadeh K, Kleiner M, Dunne E, Lee GH, Luft FC. A modified quantitative subjective global assessment of nutrition for dialysis patients. Nephrol Dial Transplant 1999;14:1732-8. Arici M, Walls J. End-stage renal disease, atherosclerosis, and cardiovascular mortality: Is C-reactive protein the missing link? Kidney Int 2001;59:407-14. Paul J, Dasgupta S, Ghosh MK. Carotid artery intima media thickness as a surrogate marker of atherosclerosis in patient with chronic renal failure on hemodialysis. N Am J Med Sci 2012;4:77-80.
de Mutsert R, Grootendorst DC, Boeschoten EW, Brandts H, van Manen JG, Krediet RT, et al. Subjective global assessment of nutritional status is strongly associated with mortality in chronic dialysis patients. Am J Clin Nutr 2009;89:787-93. Todd A, Carroll R, Gallagher M, Meade A. Nutritional status of haemodialysis patients: Comparison of Australian cohorts of Aboriginal and European descent. Nephrology (Carlton) 2013;18:790-7. Mazairac AH, de Wit GA, Grooteman MP, Penne EL, van der Weerd NC, van den Dorpel MA, et al. A composite score of protein-energy nutritional status predicts mortality in haemodialysis patients no better than its individual components. Nephrol Dial Transplant 2011;26:1962-7. Janardhan V, Soundararajan P, Rani NV, Kannan G, Thennarasu P, Chacko RA, et al. Prediction of malnutrition using modified subjective global assessment-dialysis malnutrition score in patients on hemodialysis. Indian J Pharm Sci 2011;73:38-45. 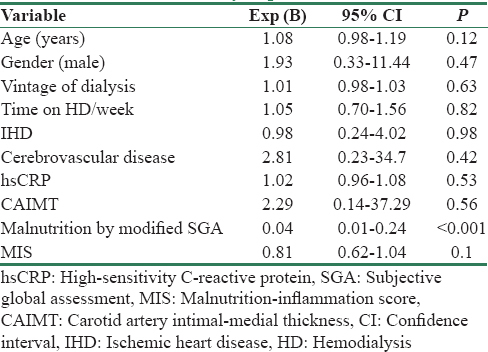 Tapiawala S, Vora H, Patel Z, Badve S, Shah B. Subjective global assessment of nutritional status of patients with chronic renal insufficiency and end stage renal disease on dialysis. J Assoc Physicians India 2006;54:923-6. Zimmermann J, Herrlinger S, Pruy A, Metzger T, Wanner C. Inflammation enhances cardiovascular risk and mortality in hemodialysis patients. Kidney Int 1999;55:648-58. Iseki K, Tozawa M, Yoshi S, Fukiyama K. Serum C-reactive protein (CRP) and risk of death in chronic dialysis patients. Nephrol Dial Transplant 1999;14:1956-60. Ridker PM, Danielson E, Fonseca FA, Genest J, Gotto AM Jr., Kastelein JJ, et al. Rosuvastatin to prevent vascular events in men and women with elevated C-reactive protein. N Engl J Med 2008;359:2195-207. Helal I, Zerelli L, Krid M, ElYounsi F, Ben Maiz H, Zouari B, et al. Comparison of C-reactive protein and high-sensitivity C-reactive protein levels in patients on hemodialysis. Saudi J Kidney Dis Transpl 2012;23:477-83. Usta S, Basbug HS, Cakiroglu Y. High sensitivity C-reactive protein: Could it be used as a cardiovascular risk predictor in haemodialysis patients? Appl Med Res 2015;1:12-5. Kanwar M, Hashem M, Rosman H, Kamalakannan D, Cheema A, Ali A, et al. Usefulness of clinical evaluation, troponins, and C-reactive protein in predicting mortality among stable hemodialysis patients. Am J Cardiol 2006;98:1283-7. Brzosko S, Lebkowska U, Malyszko J, Hryszko T, Krauze-Brzosko K, Mysliwiec M. Intima media thickness of common carotid arteries is associated with traditional risk factors and presence of ischaemic heart disease in hemodialysis patients. Physiol Res 2005;54:497-504. Salama DS, Narooinejad M, Saffari S, Khak M. Comparison of intima-media thickness of the common carotid artery in dialysis and kidney transplant recipient patients. Exp Clin Transplant 2011;9:26-31. Nishizawa Y, Shoji T, Maekawa K, Nagasue K, Okuno S, Kim M, et al. Intima-media thickness of carotid artery predicts cardiovascular mortality in hemodialysis patients. Am J Kidney Dis 2003;41 3 Suppl 1:S76-9. Sunil Kumar K, Lakshmi AY, Srinivasa Rao PV, Das GC, Siva Kumar V. Carotid intima-media thickness in patients with end-stage renal disease. Indian J Nephrol 2009;19:13-4. Howard G, Sharrett AR, Heiss G, Evans GW, Chambless LE, Riley WA, et al. Carotid artery intimal-medial thickness distribution in general populations as evaluated by B-mode ultrasound. ARIC investigators. Stroke 1993;24:1297-304. Baber U, de Lemos JA, Khera A, McGuire DK, Omland T, Toto RD, et al. Non-traditional risk factors predict coronary calcification in chronic kidney disease in a population-based cohort. Kidney Int 2008;73:615-21. Qureshi AR, Alvestrand A, Divino-Filho JC, Gutierrez A, Heimbürger O, Lindholm B, et al. Inflammation, malnutrition, and cardiac disease as predictors of mortality in hemodialysis patients. J Am Soc Nephrol 2002;13 Suppl 1:S28-36. Harvinder GS, Swee WC, Karupaiah T, Sahathevan S, Chinna K, Ahmad G, et al. 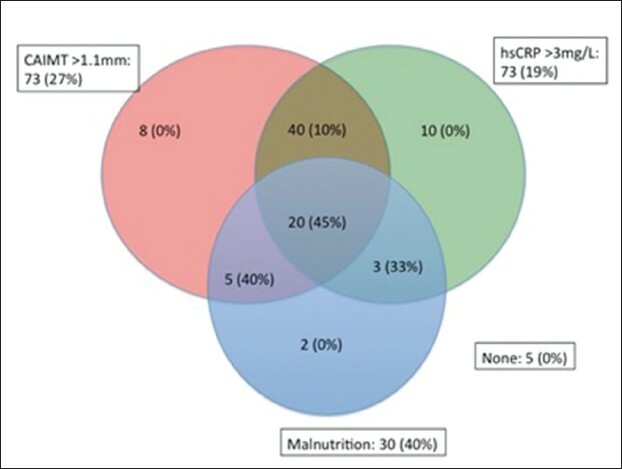 Dialysis malnutrition and malnutrition inflammation scores: Screening tools for prediction of dialysis-related protein-energy wasting in Malaysia. Asia Pac J Clin Nutr 2016;25:26-33.
de Mutsert R, Grootendorst DC, Indemans F, Boeschoten EW, Krediet RT, Dekker FW; Netherlands Cooperative Study on the Adequacy of Dialysis-II Study Group. Association between serum albumin and mortality in dialysis patients is partly explained by inflammation, and not by malnutrition. J Ren Nutr 2009;19:127-35. Zitt E, Lamina C, Sturm G, Knoll F, Lins F, Freistätter O, et al. Interaction of time-varying albumin and phosphorus on mortality in incident dialysis patients. Clin J Am Soc Nephrol 2011;6:2650-6.